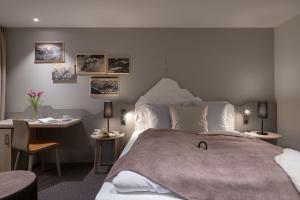 Offering mountain views, Apartment Chalet Sunneblick is an accommodation set in Grindelwald, 2 km from First and 1.6 km from Bodmi. Free WiFi is available in this apartment, located 2 km from Pfingsteggbahn and 2.1 km from Firstbahn. This apartment is equipped with a living room and a fully equipped kitchen with an oven and a fridge. A TV is offered. Ski-to-door access is available on site and skiing can be enjoyed within close proximity of the apartment. 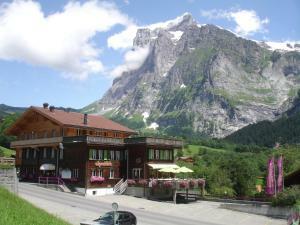 Oberjoch is 2.9 km from Sunneblick Grindelwald, while Ski Lift Grindelwald Grund-Holenstein is 5 km from the property. The nearest airport is Bern-Belp Airport, 72 km from the property. When would you like to stay at Apartment Chalet Sunneblick ? Apartment with kitchen, TV, DVD player and bathroom with shower and toilet. Each day we'll check prices and send you an email for your selected dates at Apartment Chalet Sunneblick. If you don't have specific dates but would like to check prices for say next weekend or say next month we can check the price too. Click to write a review and share your experience of Apartment Chalet Sunneblick with other travellers.